The price of bitcoin has rallied to new multi-month highs following the recent spike in optimism towards cryptocurrencies. The price of the pioneer crypto momentarily rose to about $5,488 before pulling back to bounce off again at around $4,940. And now, it has recovered from this pullback to trade well above $5,200, a level that is seemingly becoming a major trading zone. The BTC/USD (bitcoin) price now appears to be forming a short-term consolidation around the $5,200 level before making the next major move. There has been a wave of positivity around cryptocurrencies lately which was sparked by the announcement that top online retail platforms are beginning to accept cryptocurrencies for payments. This has ultimately made some crypto enthusiasts to restore their confidence in the industry that some of the leading cryptocurrencies like Bitcoin will one day form the basis of global transactions. In a recent Forbes article, one contributor said that one bitcoin could one day be worth $1 million suggesting that the pioneer cryptocurrency is the new gold. 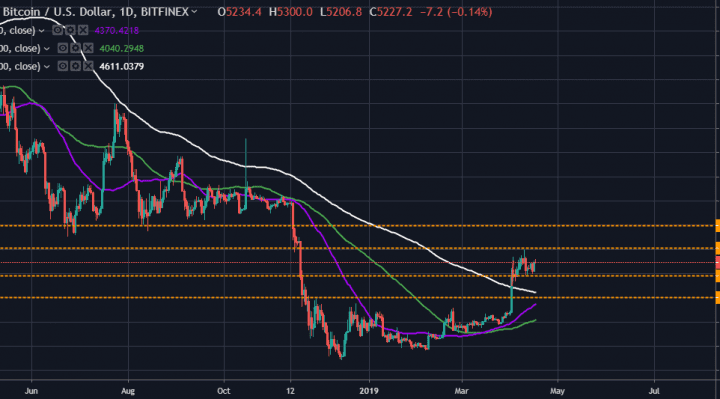 From a technical perspective, the price of Bitcoin appears to be trading within a sideways channel following the recent pullback that came at the back end of hitting the new multi-month high. This creates some interesting trading opportunities for both the bulls and the bears. The bulls will look to target opportunities at around the $5,300 level for short-term profits while the bears will hope that the current rebound is short-lived and that the BTC/USD pulls back again towards the 50% Fib level, which also happens to be the $5,200 key level. 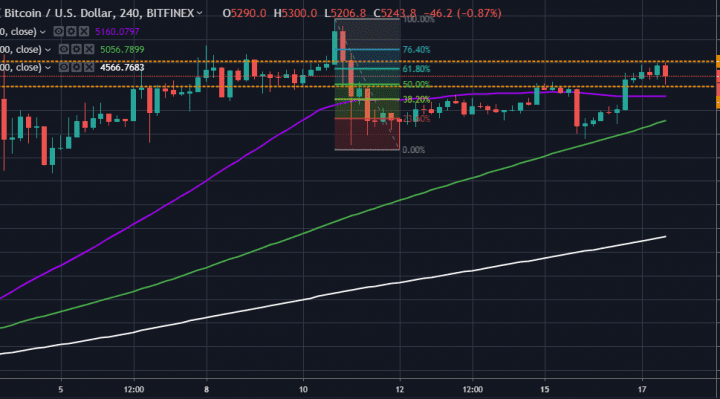 In the daily chart, the BTC/USD short-term consolidation formation appears clearer, occurring just after the recent surge in the price of bitcoin. And looking at the 50-Day, 100-Day and the 200-Day Moving Average lines, it looks like there is a lot of room to cover above the current price level. The MA lines have spent most of the time above the three lines, which means that the price of bitcoin will have to rally even further to bring them high enough before making a major pullback to drop below them. This creates multiple opportunities for both the bulls and the bears to target. In summary, cryptocurrencies appear to have regained their aura, and bitcoin is topping the charts again. The immediate future for the crypto market will be interesting to watch, but even more exciting for crypto traders.